If your browser’s new tabs started to open with Daily Funny World page, and your searches are redirected to search results on http://int.search.myway.com, you likely have a browser hijacker installed on your computer. A browser hijacker is a piece of software (a browser extension, a program or both at the same time) that can alter homepage, default search engine and some other settings of a browser. The purpose is directing more users to a specific search engine (in this case MyWay search engine) and boost its advertising revenue. Browser hijackers are usually distributed via freeware sites and get installed together with programs these sites offer. 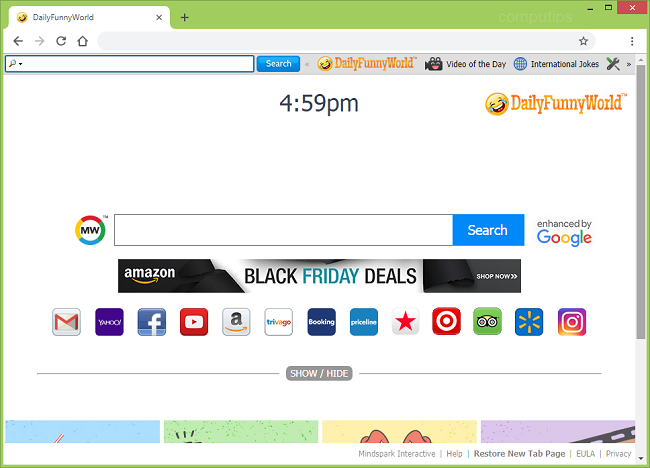 This step-by-step guide describes how you can uninstall the browser hijacker and remove Daily Funny World new tab from your browser. The easiest method to uninstall Daily Funny World is to run an anti-malware program capable of detecting browser hijackers in general and Daily Funny World in particular. You may try SpyHunter 5 by EnigmaSoft (for Windows); it has excellent detection rate when it comes to browser hijackers and other potentially unwanted programs (PUPs). You can also try to remove Daily Funny World by hand using the following instructions. Go to Programs and Features, uninstall DailyFunnyWorld if you can find it there. If it isn’t there, uninstall all programs by Mindspark Interactive Network, suspicious programs, programs you don’t remember installing, or programs you installed just before Daily Funny World appeared on your browser. When you are not sure if a program is safe, look for the answer on the Internet. Look for DailyFunnyWorld in the list. If you find the app, highlight it. To get rid of Daily Funny World, either reset browser settings or remove DailyFunnyWorld (ID: kndhnmnblafmgafodaoailhjnjbfedan on Chrome) and any other suspicious extensions from browsers and set new tab page and default search provider.